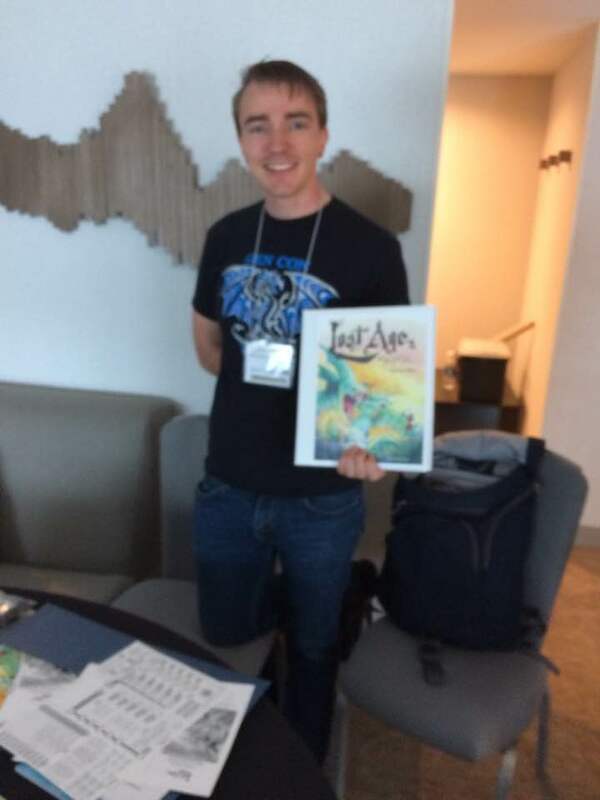 On Friday afternoon at KublaCon, Edmund and I ended up playing in The Lost Age, run by author Keith Leiker. 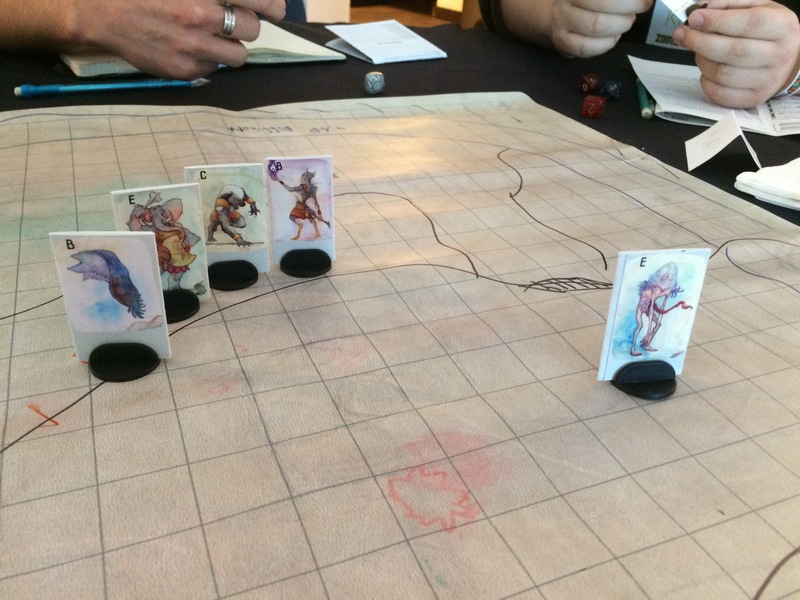 Although people had signed up for the game, they did not show up — not an uncommon occurrence on Fridays afternoon games at conventions — but we were looking to get into a game. Along with another player, Kim, we took the opportunity to try a new game. Those who know me well will realize that that this is not my forte, I’m more of a rules-light, story-heavy gamer. However, I had heard the pitch (to other potential players) before I decided to jump in, so I knew what I was getting into and I was in a mood to try something different from my usual fare, to broaden my gaming horizons if you will. The basic mechanic involves rolling a ten-sided die (d10) + applicable rank + applicable vocation rank + applicable environment rank + other modifiers. An average difficulty target number is 7. Rolling a 10 on the die is a critical success, which can grant additional benefits; rolling a 1 may mean additional problems. 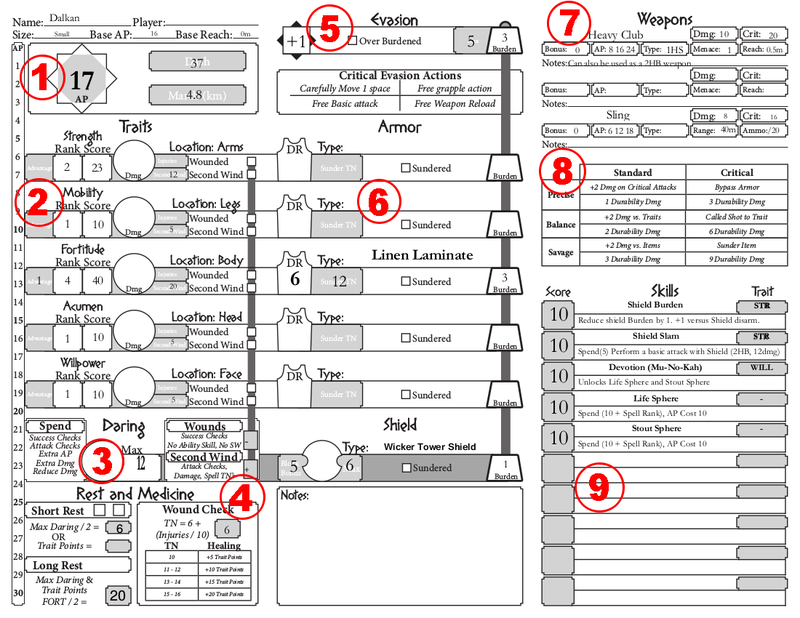 A quick-start version of the rules is available on the official website, but here is an overview using the very well designed character sheet. In combat, there is no prescribed order to movement, attack, defense, etc. ; instead, characters have a base Attack Point rating (1) which can be spent every round to do a variety of things: attack, defend, reload, absorb damage, cast spells, etc. There is a handy AP track on the left side of the character sheet that lets you mark how much AP you’ve spent during the round, using a paperclip. Characters have five traits (2) with a rank and a score (analogous to the score and derived modifier in D20-based games): Strength, Mobility, Fortitude, Acumen, and Willpower. The rank indicates your die modifier, and the score provides pools of points which can be spent to add to attack rolls and other success rolls, as extra AP for a round, to do extra damage, or to absorb damage taken. Rank is calculated by dividing the trait score by 10 and rounding down, so for example a score of 23 means a rank of 2. Here is an interesting tactical twist: you get an incentive to spend from the smaller pools because when you get to half the original pool value (round up), you get your Second Wind. You mark the Second Wind box in the trait area, and now you have +1 to all your attack checks, spell checks, and damage. However… this makes you more vulnerable to called shots, which apply damage directly to the location associated with the trait rather letting you choose where to apply it. For example, say I have already spent 5 points from Acumen, for which my character has a score of 10 (so rank 1). That has let me reach my second wind, yay! But now my opponent does a called shot to the head. If he succeeds in inflicting damage, my character will be wounded by even a modest blow unless I have some other way of absorbing damage! A flexible pool, Daring (3), can be spent in the same way as trait score pools; it does not provide a second wind, but it is easier to replenish with combat spells or after short rests (4). Wounds affect associated trait checks and negate the related second wind, and of course healing takes longer. Evasion (5) is the defense ability; it’s made interesting by the chance to take additional evasive actions if you roll a critical success (a 10 on the die): a free attack, free reload, etc. Armor (6) can be worn for each of the locations associated with the five traits, protecting you from called shots, and the character sheet is cleverly laid out to track trait, location, and armor together. After a certain number of uses to absorb successful enemy hits, armor and shields are too damaged to use, or “sundered”. They can be repaired later, with appropriate skill, but are no longer useful until then. Weapon stats (7) look like you would expect, with a few additional twists. They give you a Menace range which your allies can benefit from, thus simulating combat conditions such as flanking, outnumbering, greater reach, etc. The stats also provide the AP cost for drawing the weapon, as well as for single and multiple attacks. Different weapon types benefit from a variety of standard and critical weapon effects (8) that enrich tactical options. Skills (9) are primarily combat skills and include special maneuvers, spells, and so forth. Skill rank and therefore roll modifier is calculated like for traits: divide score by 10 and round down, so a score of 10 means a rank of 1. For non-combat actions, look to Goals, Vocations, Environments, and Renown (10); they provide abilities and circumstances that give bonuses when applicable. Again, the rank and die modifier is calculated by dividing the score by 10. Player characters are expected to have relationships with the other heroes (11), much like in games Powered by the Apocalypse (PbtA). Each template comes with one predefined relationship, but you can choose who it applies to and define it on your own terms. Finally, characters have equipment, relics (which have magical qualities), and miscellaneous special abilities (12) often related to species or equipment. The setting is not pseudo-European but instead it is inspired by Egypt, Israel, and the Eastern Mediterranean coast, which I found refreshing. There are also a variety of non-player-character sentient and semi-sentient species; I regret that they do follow the conventional RPG model of offering the players guilt-free genocidal attitude (i.e., the “bad” races meant to be fought and killed without remorse, such as the Terasu.) On the other hand, it’s possible that the nuances are there, just not thrown in for a short convention demo game. Here is a part of the game play experience that does not come from the game itself: Keith Leiker is a good game-master. He was very good at teaching the rules, but also very adaptable in play, making the game flow from the characters’ actions rather than railroading or trying to get us to play a certain way. The rules were more fiddly than I usually prefer to play these days, but the character sheet is very well laid out to make play easier. Like in the few other crunchy games I still love and play, I felt that the rules elegantly implemented a design purpose, rather than resulting from a design failure. 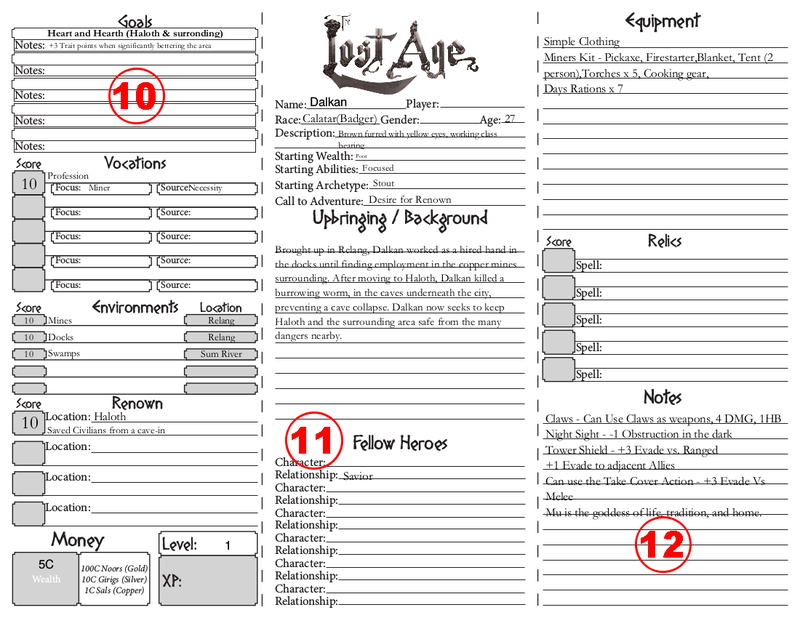 The Lost Age has very few mechanics supporting non-combat actions, which also tends to be a red flag for me. However, we did have a fun time talking to villagers and investigating suspicious disappearances. Game play offers a lot of tactical options every turn in combat. The action point system feel much more fluid and natural than the traditional division between movement, standard action and minor action found in a lot of tactical RPGs, and it encourages players to try different things to make the most use of their action points. Characters felt competent and versatile, like seasoned adventurers. I think the mythic quality the author was reaching for is achieved. Advancement comes both in the form of experience points that are used to increase your overall character level, and in gradual increases to trait and ability pools. Leveling was also easy and offered very flexible rewards, so your character can evolve the way you want rather than following a rigid template. Although I really liked the setting, I think it would be relatively easy to adapt the rules to a different fantasy setting of comparable technological and magical level. For example, they might be hacked to play in other fantasy settings like Glorantha or Tékumel. 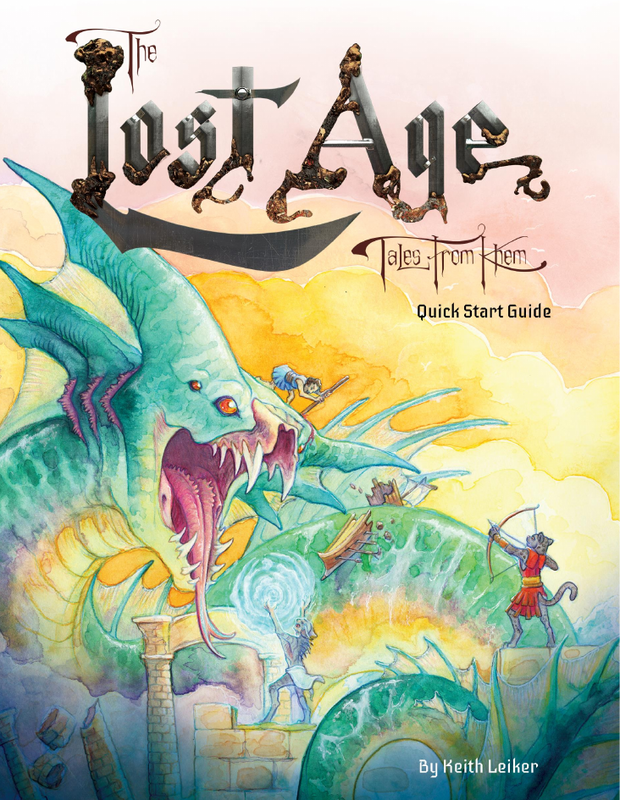 Verdict: If you enjoy games like Burning Wheel, Pathfinder, or Gloomhaven, I suggest checking out The Lost Age. Posted on May 27, 2017 June 7, 2017 by Sophie LagacéPosted in games, rpgsTagged conventions, fantasy, games, KublaCon, reviews, rpgs, weekend. Previous Previous post: Listen to the Return of Castle Falkenstein!